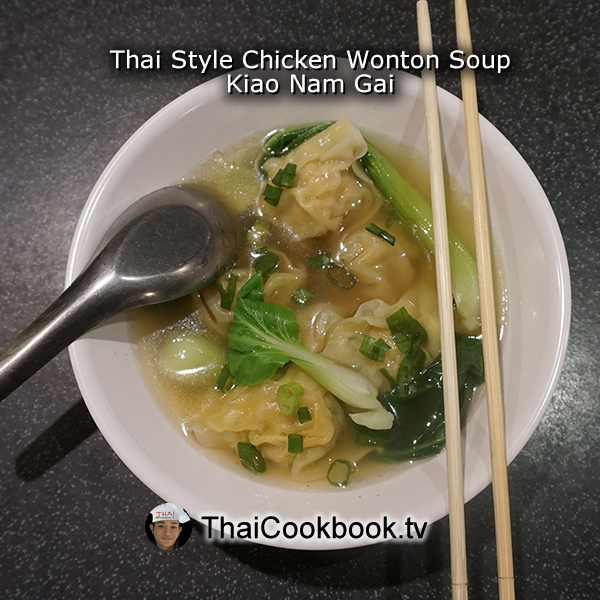 To make this delicious Thailand-style wonton soup we start by infusing the chopped chicken filling with the distinct Thai flavors of lemongrass, kaffir lime leaf, coriander root, and garlic, and serve them with crisp bok choy Chinese cabbage in a rich and fatty chicken broth. Like nearly all Thai soups, we season each bowl at the table with a selection of condiments to add spicy, sour, sweet, and salty flavors. 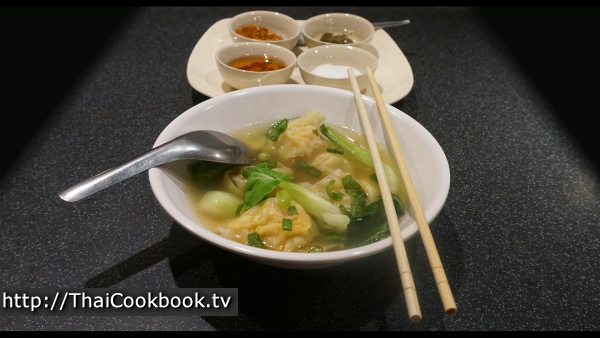 What's in our Chicken Wonton Soup. How we make our Chicken Wonton Soup. 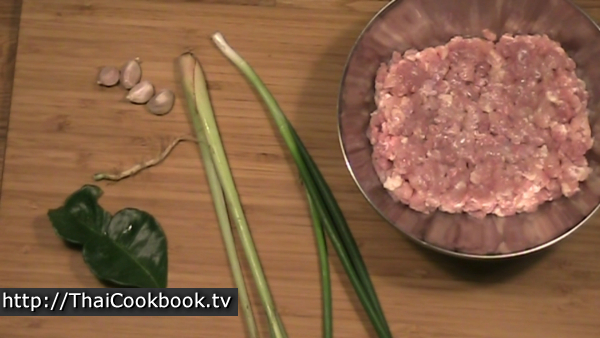 1) Grind the lemongrass, kaffir lime leaf, garlic, and coriander root into a smooth paste. Blend the paste together with the chopped meat, green onion, tapioca flour, white pepper, fish sauce, and sesame oil, then fill and wrap the wontons. 2) Create the soup broth by adding coriander root, white pepper, garlic, oyster sauce, and soy sauce to unseasoned chicken or vegetable stock. Boil hard for 5 minutes. 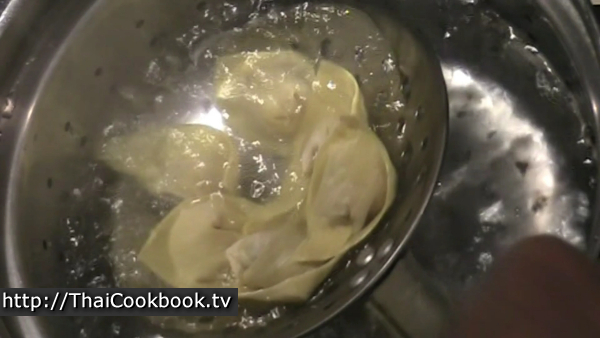 3) In another pot, heat some water and boil the wontons for 5 minutes. Remove them and place in a serving bowl. 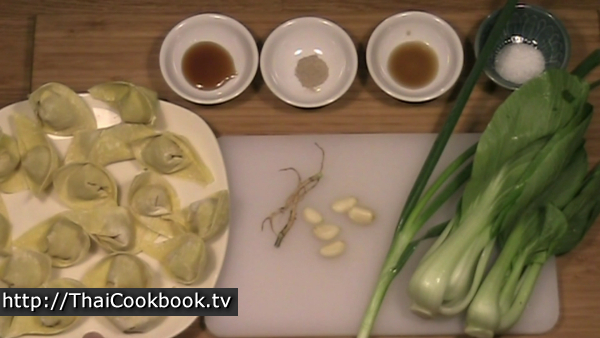 Next, blanch the bok choy leaves for about a minute and place them in your bowls with the wontons. 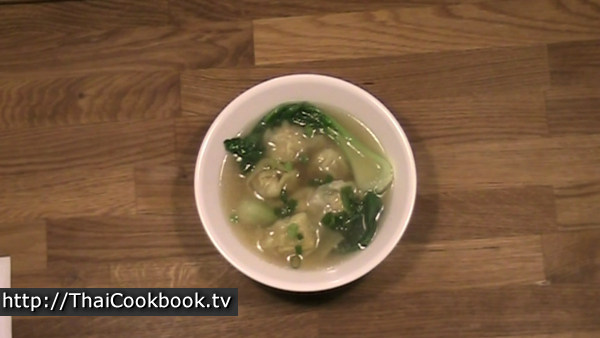 Spoon enough of the broth over the bowl to lightly cover the wontons and bok choy. 4) Top with chopped green onion and a sprinkle of finely ground white pepper. Serve with table condiments of your choice, including sun-dried red chili flakes, pickled green chilies, fish sauce with red chili, and sugar. You might recognize these photos from my previous recipe for fried wontons. The ingredients for the wonton are exactly the same, so I made both from the same batch of filling. 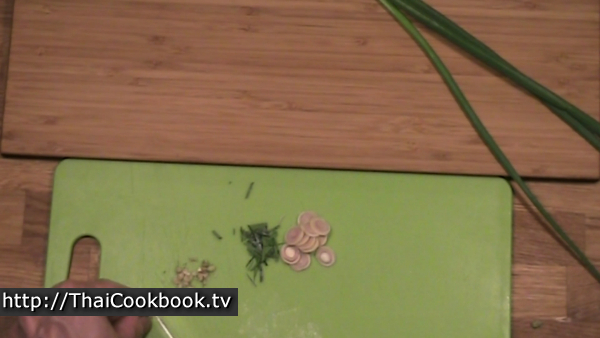 Cut the lemongrass, kaffir lime leaf, and coriander root into very small pieces. 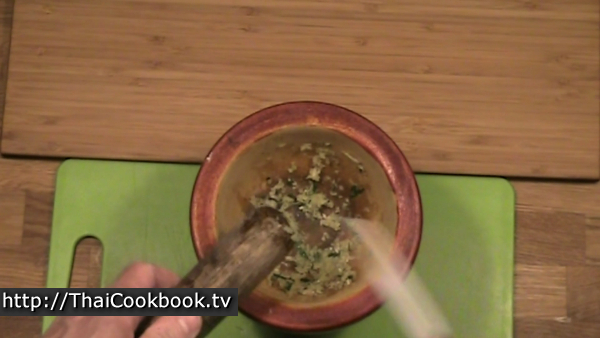 Grind it all together with a mortar a pestle until very smooth. If you have a food processor you can do this just fine. You want to have a smooth herbal paste. 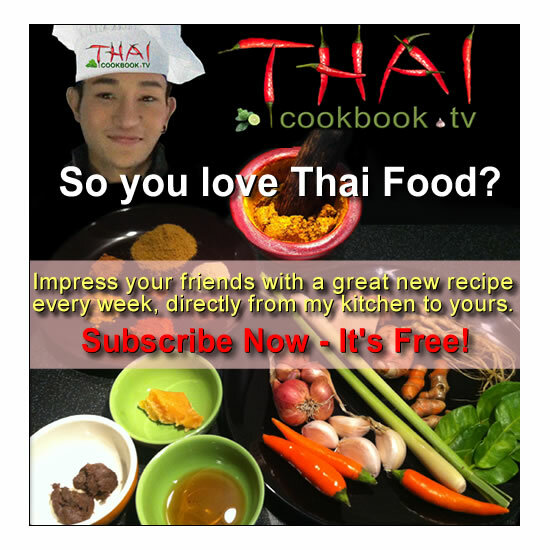 Mix the herb paste with the ground meat, along with chopped green onion, the tapioca starch, white pepper, fish sauce, and sesame oil until smooth. 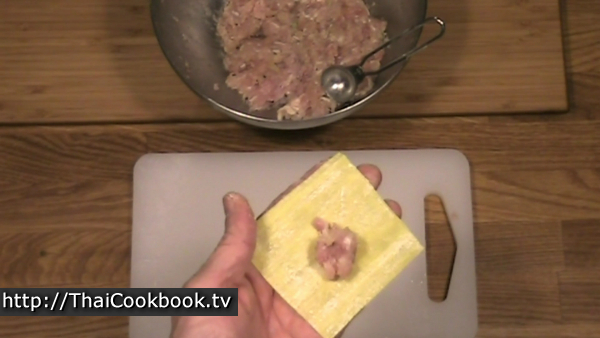 Lay a wonton wrapper in one hand and put 1 teaspoon of the filling in the middle. Dip your finger in water and wet two edges of the wrapper. Fold it over into an even triangle, squeeze out the air, then pinch the sides together until they form a solid seal. If you like to keep things easy you can leave them as triangles, or for a more decorative way follow the next steps. Point the folded side away from you in both hands, then slowly pinch and bend that side together until the tips meet. Go slowly and bend the edges up so they don't tear. When you get it close enough to touch, wet on tip and then stick them together well. The finished dumpling will look a little like a boat or flower. Do the whole batch before you start making the soup. Heat the chicken or vegetable stock in a large soup pot, then arrange the ingredients. Remove the leaves from the bok choy and wash them well. Cut the coriander root into very small pieces. Grind it together with the garlic until very smooth. When the stock is boiling, add the garlic and coriander root. Next add the oyster sauce, soy sauce, white pepper, and sugar. Stir it all up well and boil for about 5 minutes. In another large pot, boil some clean water. 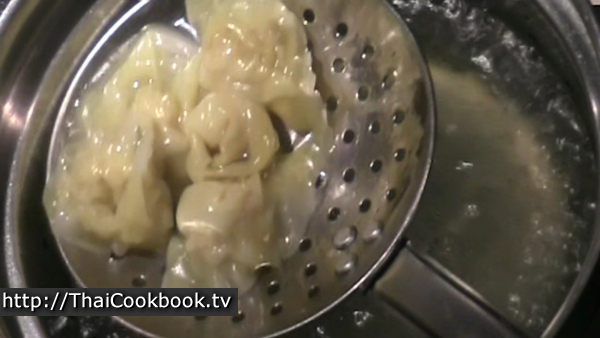 Add the wontons to the boiling water and cook them for about 5 minutes. Avoid stirring them too much so they don't get broken. Remove them from the water carefully and arrange 2 or 3 in small serving bowls. Next, blanch the bok choy leaves in the hot water for about a minute. 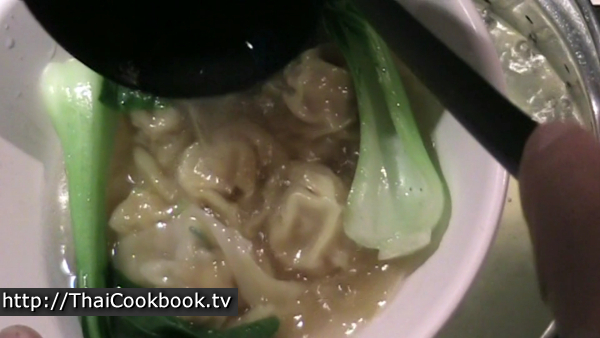 Put 2 or 3 leaves in the bowls with the wontons, then pour some of the soup broth over it all. 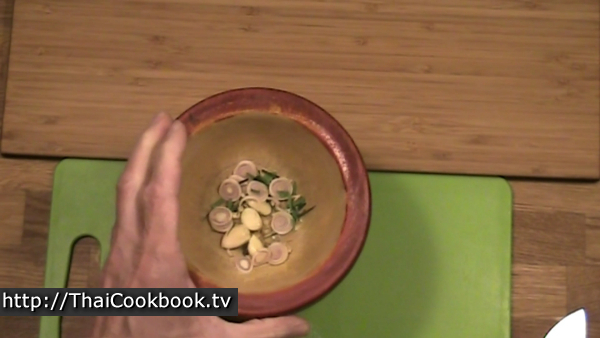 Put a few pieces of chopped green onion over the bowl, and sprinkle a dash or two of finely ground white pepper. 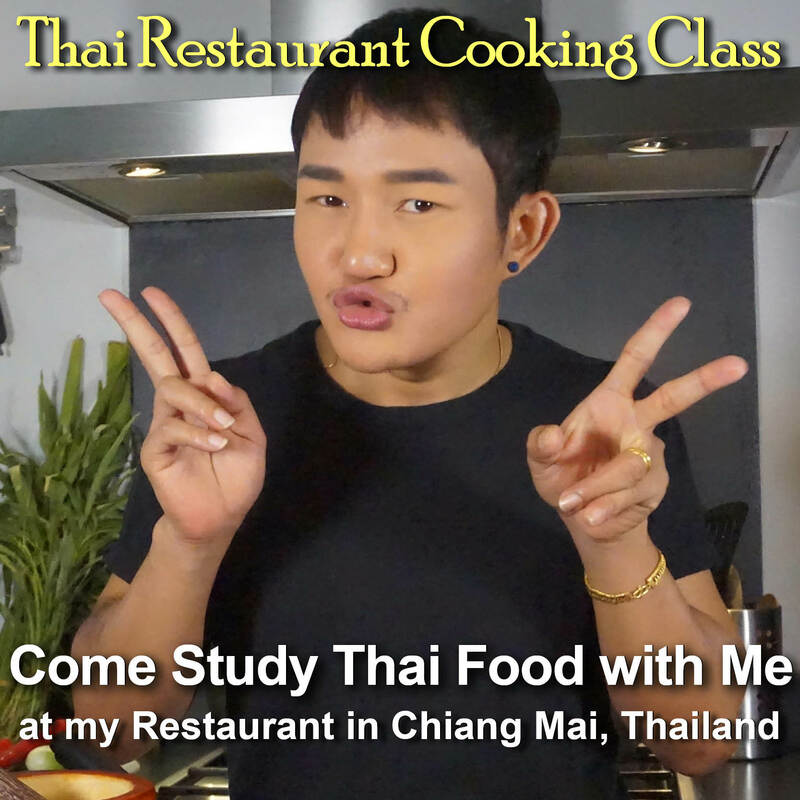 Another main difference the distinguishes Thai soups from others are the four condiments that are always available. They are ground, sun-dried red hot chilies with the seeds left in, pickled hot chili, fish sauce with red red chili, and sugar. We use the dry chili flakes to add spiciness. The pickled chilies are in a vinegar base. They are not too spicy, and we use it to add a more sour flavor to the soup. 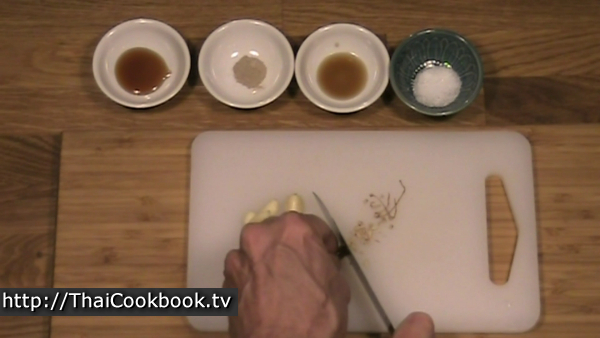 Fish sauce with fresh hot chili is used to add both spicy flavors and salty flavors. 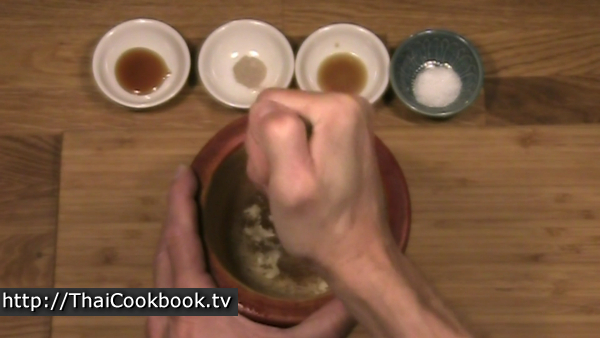 Fish sauce is very salty and we use it on everything as needed instead of table salt. The last seasoning is just regular sugar. We use the 4 flavors of spicy, sour, salty, and sweet to customize every type of soup at the table.